Registration is required of all students. If you have not yet made it into the office to register for the 2018-19 school year, you will have to do so no later than Wednesday, August 8th. Returning students may stop in on Wednesday, August 8th between the hours of 9:00 AM and 3:00 PM to complete registration. You should come prepared with two items of proof of residency (i.e. utility bills, drivers license, vehicle registration.) If you are unable to come in during those times, contact Mr. Baxter at (773) 534-9710 ext. 12195 or dbaxter@chiarts.org to schedule an appointment. Freshmen students and transfers who have not completed the registration process must contact Ms. Marsh at (773) 534-9718 or lmarsh@chiarts.org to schedule an appointment. Seniors must have their new vaccination records in no later than September! New students will be attending our three-day Summer Institute from Wednesday, August 8th to Friday, August 10th. 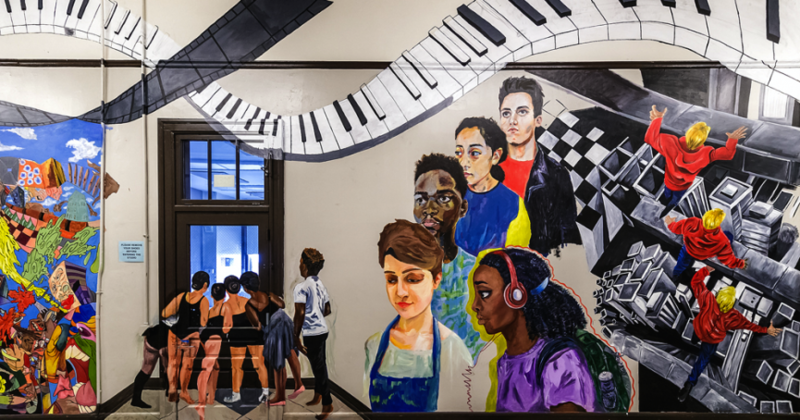 This is the perfect time for incoming scholar-artists to become familiar with their teachers, academic classes, and the ChiArts conservatory schedule. Activities include ChiArts themed ice-breakers, meet and greets with faculty, and attending conservatory classes to get ready for the fun-filled year. Students are welcome to enter the building through Door 7 along Augusta Boulevard starting at 8:45 AM. Once each student has checked in, they will meet their advisor who will show them to their rooms and help each student understand their schedule. It is during this morning shift of 9:00 AM to 12:00 PM that students will be receiving their school planners, locker assignments, locks, and student email logins. The students will be shown to the lunchroom at noon and provided school lunches. Students are welcome to pack a lunch if they would prefer. From 1:00 PM to 4:00 PM students will head to conservatory — dancers should bring dance clothes/uniforms with them to school on these days. All students are encouraged to bring water bottles from home to remain hydrated throughout the school day as well! Students will be dismissed at 4:00. New students and families who may be unfamiliar with a block schedule may want to review how our school days work. An ordinary school day begins at 8:00 AM and consists of a student attending 3 academic courses and Study Hall or Advisory before going to lunch. After lunch, students attend conservatory classes until being dismissed for the day at 5:00 PM. 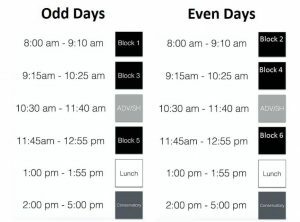 Each school week consists of Odd Days and Even Days: on Odd Days, students will attend Class 1, 3, and 5; on Even Days, students will attend Class 2, 4, and 6. In addition to their academic courses each morning, students will attend Study Hall or Advisory. On Mondays, Wednesdays, and Fridays, students attend Study Hall; on Tuesdays and Thursdays, they would instead report to their Advisory. 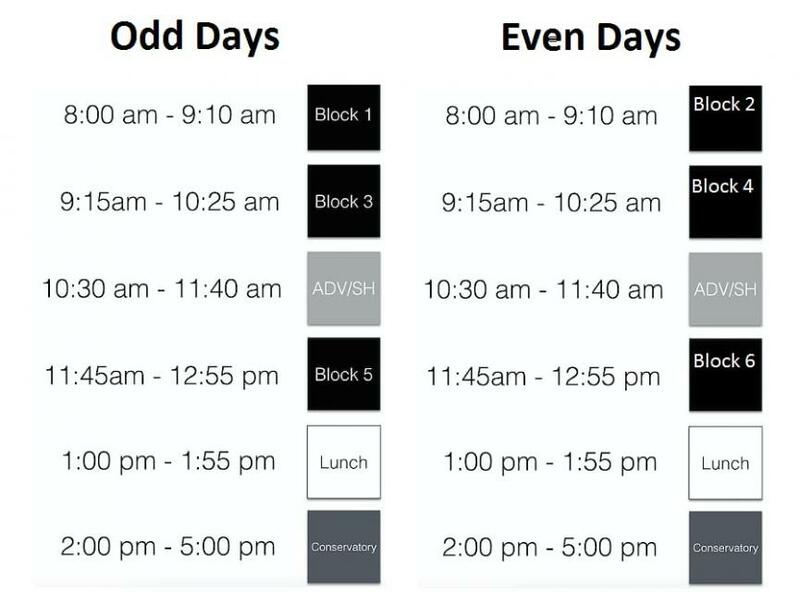 A visualization of a typical block schedule is included below. Lunches will continue to be provided for each student, and shuttles will be running for students who have signed up to take them. Ventra cards will be available for students in the main office for five dollars for any student interested in taking public transit; once activated, the cards are charged a discounted student fare. We’re encouraging families to hold off on purchasing all of their supplies until the second day of school so that they have a complete syllabus from each class. Each teacher will be providing a syllabus with the materials they’d like students to have on the first day of class, so keep your eyes peeled for these! If you have questions in the coming weeks, ask! Our school staff is here to help!